A teenage driver is distracted by a passenger in the back seat of his car and begins to drift over the center line. A man driving on a dark road in Scio Township reaches for his cell phone after he dropped it on the floor. 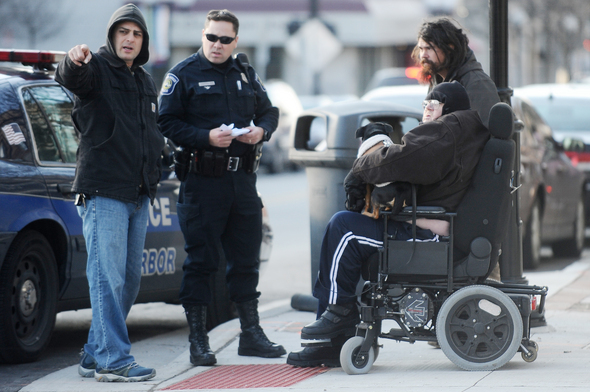 A man in a wheelchair starts to cross a street in downtown Ann Arbor and sees a woman driving toward him, appearing to be talking on a cell phone. These are just three cases of distracted driving that led to crashes in Washtenaw County from 2008 to 2010. According to data from Michigan Traffic Crash Facts, there were 701 people involved in distracted driving crashes in the county during that period, and 115 people involved in cell phone-related crashes. In that period, two people died in crashes in Washtenaw County because of distracted driving, and one person suffered injuries in a crash caused by cell phone usage in 2010, according to MTCF. Cell phone usage and other distractions are well-known dangers to many area police officials. Washtenaw County Sheriff’s Office Detective Robert Losey can recite off the top of his head the statistics on how dangerous not focusing on the road can be. “Removing eyes from the road for two seconds at 55 miles per hour causes you to travel 160 feet unaware of what is in front of you and creating a total emergency,” Losey said. “Stopping distance is about 300 feet, or a football field in distance. Gary Lillie’s death does not fall within the time frame defined by the Michigan Traffic Crash Facts, but the car crash that claimed his life — allegedly was linked to distracted driving — remains fresh in the memory of Washtenaw County residents. According to testimony from a preliminary examination, Kevin Warren was driving on Baker Road near Marshall Road late on Aug. 4 of last year when he dropped his cell phone. Warren later told police that as he reached to pick it up, he felt a bump on the side of his car. Warren told police that he initially thought he'd hit a deer; it wasn’t until later that he called 911 to report that he'd struck a person, police said. Warren now faces criminal charges for the incident: operating while intoxicated causing death and leaving the scene of an accident resulting in death. Blood tests showed Warren had a blood alcohol level of .12 after the crash. The legal limit in Michigan is .08. It’s surprising how few crashes are directly attributed to distracted driving given the amount of cell phone use and other distractions police observe on the roadways, officers said. Saline Patrol Officer Theo Helms said about half of the people he pulls over are on their cell phones and about 70 percent of the people he observes speeding are using their phones. Helms said most accidents caused by drivers talking on their cell phones in Saline are simple fender-benders that don't result in serious injuries. Helms and other police officers said not many crashes are directly labeled as caused by distracted driving or cell phones because a driver can hang up before an officer arrives and not admit to cell phone usage. Instead, the causes could be officially filed as following too closely, speeding or another violation, according to Lt. Renee Bush of the Ann Arbor police. Ann Arbor was the scene of a hit-and-run incident in early December when Gerald Foster was crossing East Liberty Street at South Fifth Avenue in his motorized wheelchair, heading toward the Afternoon Delight Cafe when a woman, who appeared to be talking on her phone, turned the corner in her car and struck him. Foster’s wheelchair and right leg were struck by the sport utility vehicle and he fell to the street, he said. The driver immediately began driving away, he said. 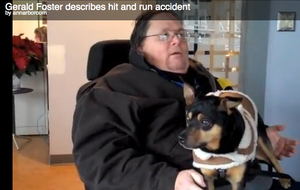 Foster was walking his dog — a 2-year-old rat terrier named Sarge, who was not hurt — when he was struck by the SUV. He said he walks his dog daily, and there have been too many close calls with distracted drivers for his liking. However, it’s not always cell phones that are at fault. Drivers can be distracted by many other factors as well, according to police. In one fatal accident in September 2010, a 17-year-old boy from Northville was driving his 1995 Jeep with a 16-year-old Howell boy and a 15-year-old Northville girl eastbound on Six Mile Road in Salem Township. According to police, the driver was distracted by one of the passengers in the back seat. Police said the Jeep began to drift over the center line as it headed east when the driver realized what was happening and over-corrected. The movement caused the driver to lose control and go off the roadway to the right side of the road, striking a tree, police said. Both of the passengers in the rear seat were not wearing seatbelts and were ejected from the car, according to police. The 16-year-old boy from Howell was killed at the scene of the crash and Survival Flight took the 15-year-old Northville girl to University of Michigan Hospital, according to police. She had suffered critical injuries, police said. It was another tragic example of what can happen when a driver's focus is taken away. Any number of things could be cause for worry, Helms said. “Anything that takes your mind off what you’re doing on the road is dangerous as far as I’m concerned,” he said. Thu, Feb 16, 2012 : 11:21 a.m.
Kyle, Our family has had nothing but the utmost respect for you in you coverage of my Godfather's death and the trial associated with it. I have praised you for your honest reporting and your sensitivity to this case on both sides. As I have said before, in a case like this there are no winners.....Not only have we lost our beloved, Mr. Warren's family must certainly be grieving as well. While we the alleged &quot;victim&quot; family have been going through sheer hell we have had to also find ourselves delayed in the justice process due to unforeseen circumstances. We have continued to pray and stick together as a family, as that is the best we can do. As for this article, Kyle, I must tell you (with sincere honesty and respect to you as a journalist), that I feel the case of my Uncle Gary should not have been included. My Uncle's death was allegedly the result of a driver (Mr. Warren) who was legally drunk. Gary's death was not the result of a driver simply distracted by a cell phone. As a media representative, Kyle, you know the power that media has to influence the thoughts and feelings of readers. To include such a high profile case as Gary's in an expose of &quot;distracted driver&quot; stories was not only a poor choice, but a potentially damaging to the upcoming trial. It makes us feel as if you are making a defense case for Mr. Warren that he was a distracted driver instead of a DRUNK DRIVER as the pre-trial evidence has shown. As we all know Mr. Warren is innocent until proven guilty, and my thoughts and opinions are my own and no one elses. I just want to be sure that we are not influencing people to believe that this case is that of a distracted driver, evidence has been shown in court to educate us otherwise.. I believe there is enough blame to go around for everyone, pedestrians, bicycle riders and drivers. I've seen people do some pretty stupid things on all ends, both while on cell phones or other distractions. What really ticks me off is the air of superiority that seems to be prevalent in A2. Especially downtown and on campus. People seem to think they are the only ones that matter and are therefore &quot;Entitled&quot; not to have to go out of their way to watch out for others. WAKE UP!!! Mon, Feb 6, 2012 : 5:14 p.m.
Do you really think it's worse in Ann Arbor than other places of its size? Mon, Feb 6, 2012 : 1:53 p.m. Guess I'll have to turn in those kids, then. Driving while parenting is incredibly distracting. However, this is an example of why people on bikes and walking need to have the same awareness that people driving should have. All it takes is a split second for both parties to not pay attention for a tragedy to occur. Even those trying to be very aware have distractions. Mon, Feb 6, 2012 : 5:05 p.m.
Soooo true, Celia.... soooo true! Mon, Feb 6, 2012 : 7:25 a.m.
One study that made its way into the news showed that laws that punish drivers for using cell phones while driving are not only ineffective at reducing cell phone use while driving but actually make the roads slightly less safe as drivers try to not get caught in less safe ways. It is also undeniable that cell phone use while driving is dangerous; one study suggested that using cell phones while driving is more dangerous than driving under the influence of a 0.08 blood-alcohol level. It is clear in my mind that the problem will not be solved by simply banning the use of cell phones while driving and giving the police authority to ticket drivers. Other methods need to be used. I would suggest taking advantage of the fact that it is really in a drivers best interest to not talk on a cell phone while driving. It is not uncommon for people to evaluate risk incorrectly or to make less than optimal choices when evaluating trade-offs. Mon, Feb 6, 2012 : 4:24 a.m. I think we should study every accident and every way that people are killed and pass some kind of law to protect all of us from harm. Has anyone ever studied whether people with dark hair vs. light hair have more fatal accidents? How about oriental drivers vs. caucasians? How about cars that are closer to the ground? are there more fatalities from those? How about cars that weigh less than 3000 lb? Maybe we should mandate that cars weighing less than 300 lbs are illegal. Too bad if you own one, they are more dangerous. Mon, Feb 6, 2012 : 3:11 a.m. The AA city council is not helping with the pedestrian death crosswalk ordinance. They are putting pedestrians in greater danger by giving them the right of way in such dangerous environment. People are going to be severely injured or killed if this ordinance is not repealed. Do you really want to see a child hit by one of these distracted drivers. Please use common sense. This ordinance is bizarre for many reasons. Mon, Feb 6, 2012 : 3 a.m.
Tue, Feb 7, 2012 : 7:42 p.m. Such linear logic, Mike. No. When will they ever learn right from wrong. Mon, Feb 6, 2012 : 4:30 a.m.
What, that you can't mandate everything and protect everyone from evey eventuality in life? Mon, Feb 6, 2012 : 1:23 a.m.
Hey, annarbor.com...can we get an update on Mr. Foster's incident with the SUV...? Mon, Feb 6, 2012 : 1:07 a.m. It's not a shortage of police officers that is causing so many distracted driving accidents, it's the complete disregard for driving safety. We should have mandatory sentencing for distracted drivers involved in an accident. I see those signs that say kill or injure a road worker go to jail for 15 years. What makes them more important than us civilians? Those signs should read kill or injure any pedestrian or bicyclist, go to jail for 15 years. Sun, Feb 5, 2012 : 11:42 p.m. I don't remember when a Shannon Griffin was killed on westbound I-94 between Ann Arbor-Saline Road and Jackson Road, but she died from that accident while talking on a cell phone. Police closed the ramp from southwestbound Ann Arbor Saline Road to westbound I-94 because of the accident. Shannon Griffin was engaged to be married. Engaged people losing their fiances and fiancees might be more effective in persuading future spouses-to-be to refrain from distracted driving, and their future in-laws. Sun, Feb 5, 2012 : 11:30 p.m. I read a published psychology journal article about experiments showing that hands-free phone use is nearly as bad as otherwise. And talking with a passenger or listening to the radio are fine. The main issue comes from having an unrelated discussion with a distant person who is insensitive to road/traffic conditions. It takes attention away from driving, so that even things that are seen by your eyes aren't processed because of the lack of attention. Mon, Feb 6, 2012 : 12:36 a.m. Yes I heard that too...but in my personal experience I find that myself and others seem to be more distracted by the people in their car than by those they are talking/listening to on the phone. And I often hear the complaint of teenagers being distracted by friends in the car, although I've personally seen many adults being completely focused on things other than the road when they have others in their car, children or adults. Sun, Feb 5, 2012 : 10:51 p.m.
"Removing eyes from the road for two seconds at 55 miles per hour causes you to travel 160 feet unaware of what is in front of you and creating a total emergency," This is very true. But it doesn't only pertain to cell phones, teenagers, and eating. What about radios, MP3 players, changing CDs, turning on/off air or heat, talking to others in the car, etc? I'm sorry but no law will every completely get rid of distracted driving because you cannot control a persons thoughts. A better option is to provide people with handless cell phone devices and teach proper driving skills on a regular basis like maybe every 4 years or so require people to take a refresher course instead of teaching a class once to teenagers that isn't even required for people over 18 as long as they can pass the test. Besides that there's not much can be done about this. There will always be nuts people out there smacking their kids in the backseat or trying to hand them stuff, reaching for something (a phone or whatever) on the floor, reaching down on the passenger side floor to find which CD they want to listen to, etc. The best advice I can give is just watch out for what other people are doing. Mon, Feb 6, 2012 : 4:53 a.m. Agreed AGAIN. As someone stated earlier, as a motorcycle rider myself, the DRIVER is responsible for WATCHING THEMSELVES and EVERYONE ELSE on the road. If more automobile driver thought like motorcycle riders have to do on a regular basis....there would be less accidents in general. But, in the end, your fate is determined by a POWER GREATER than you. When its' your time to leave this Earth, you will....no manner how much Government Regulation passed into law. Sun, Feb 5, 2012 : 8:52 p.m. Some People cant imagine life with out a cell phone! some People are on that cell phone the minute they awake! some People never knrew that their was a day when cell phones didn't exist! before I received My drivors license I had to attend manitory drivers ed. that was in 1974, We did not have cell phones than they did not excist, I have never been in an accident while I was driving , I paid attention maybe if they did have cell phones.....I dont Know! Mon, Feb 6, 2012 : 2:34 a.m.
&quot;...some People are on that cell phone the minute they awake! &quot; I always wonder how they could possibly have so much to say. Most of it is pure b.s., I'm sure. Ever notice that vacant look in their eyes while they are talking. Sometimes while waiting for a light to change I notice how many people driving around the corner in front of me are talking on the phone. Huge percentage at all hours. Sun, Feb 5, 2012 : 8:20 p.m. I think the only way to effectively reduce diverted attention by cell phone use is to make use of the technology that cell phones have now. It would require new laws to be passed, but for the good of all, especially if it could save the life or injury of a loved one. I'm referring to the ablity to detect that a user is moving at a rate greater than walking. Cell phone companies can detect this from monitoring the towers that monitor the user's signal. If the users signal is traveling greater than lets say 5 mph, then all in going and out going communication must cease until users rate of speed decreases to 5 mph or lower. Yes, this would be an inconvience to all those who use their cell phones that are passengers, but I would consider it a worthy sacrifice if it would prohibit a tragedy for a member of my family or myself. At least it would be worthwhile to enact a law that would prohibit minors on their cell phones to communicate while driving. Teenagers are not yet mentally mature enough to weigh consequences of their actions. This much has been proven. That's why I think this solution would prove to be an effective solution for distracted driving accidents and injuries. Sun, Feb 5, 2012 : 8:07 p.m.
1) Is it true that a cell phone records the exact time &amp; date of each conversation &amp; Text? 2) Is it true that the phone number on the other end of the conversation is recorded? 3) Is it true that most vehicles' on-board electronics record the time of crash events? 4) If 3 is not true, there may be another way of time-correlating the crash with cell phone activity. (See 2 above) It seems that we have some unused good tools available. Let's use them to impose severe penaltys in the cases where cell phone usage correlates with damege or injury. Please don't argue that punishment after the fact won't correct the problem. It won't, but it likely will reduce the problem. Mon, Feb 6, 2012 : 4:28 a.m.
Sun, Feb 5, 2012 : 6:36 p.m.
Michigan needs to get with the times and ban cellphone use while driving. How many more people must die in this state from distracted cellphone use? Sun, Feb 5, 2012 : 7:19 p.m.
&quot;How many more people must die in this state from distracted cellphone use?&quot; How many have so far? From the story: &quot;It's surprising how few crashes are directly attributed to distracted driving given the amount of cell phone use and other distractions police observe on the roadways, officers said.&quot; BTW, I think using a phone while driving should be illegal, but I don't care for the hyperbole. Sun, Feb 5, 2012 : 6:35 p.m. So many drivers comment in these threads that everyone else is at fault for their distracted driving. There seems to be an attitude from some drivers that they are &quot;Entitled To Be Distracted&quot;. They can't watch for pedestrians because there is too much else to look at They can't stop for pedestrians because they might get rear ended They can't stop for pedestrians because they are going too fast They are not at fault for hitting a pedestrian in a crosswalk because the pedestrian should not have expected the driver to yield Etc. Tue, Feb 7, 2012 : 6:51 p.m.
@JCJ, pedestrians are not operating the heavy machinery. But nice try at shifting toward the person walking. Mon, Feb 6, 2012 : 4:26 a.m.
Why are they called accidents? Life is dangerous, if you don't like it you might want to consider staying in your house. Sun, Feb 5, 2012 : 11:06 p.m. Same old off the wall arguments. It would appear pedestrians are the ONLY ones that never break the law! Sun, Feb 5, 2012 : 5:29 p.m.
Mon, Feb 6, 2012 : 4:49 a.m.
Mike, Agreed. On this one I have to ask....how much Government Regulations we NEED in OUR VEHICLES. Accidents happen...by thousands on a day and a cell phone has nothing to do with it. In fact, were is the DUI article. That is more needed and necessary. Sun, Feb 5, 2012 : 4:59 p.m. I too am a &quot;typical&quot; victim, but the kind which gets less publicity. On December 2nd 2011, my trusty 1995 Ford Ranger &quot;long bed&quot; XLT pickup truck was destroyed by a 19 year old &quot;distracted&quot; driver. It cost my insurer's over $3,000 and me &quot;out of pocket&quot; another $6500 to complete the process of purchasing a &quot;replacement.&quot; A picture is worth a thousand words: <a href="https://plus.google.com/photos/102696563243377379265/albums/5681671113483966305" rel='nofollow'>https://plus.google.com/photos/102696563243377379265/albums/5681671113483966305</a> I was lucky I wasn't killed, as was the distracted driver. It was largely because I had &quot;helper springs&quot; installed when I upgraded my rear shocks on this truck, and because Honda engineering does a good job with &quot;crumple zone&quot; design that both of us walked away from this with no serious injury. Sun, Feb 5, 2012 : 5:36 p.m.
Mr. Ayres - you are very fortunate that you didn't die and that you had the helper spring installed. I know of a family who was driving in their pick up truck on a Sunday morning. The dad was driving, the daugher was in the middle and another family member on the passenger side. They were hit head-on by distracted drivers - teens who had been out all night drinking. The truck was hit so hard (in a residential 25 mph zone), the engine of the truck was forced through the dashboard crushing the daughter. The driver and other passenger survived with serious injuries. This was a tragedy that did not need to happen. Careless driving. Sun, Feb 5, 2012 : 5:32 p.m. There are many anectdotal stories like these. There are also many stories of motorists saved because they carried a cell phone or someone who had one stopped to call the police or render assistance. I think the good far outwheighs the bad. If they are outlawed then why pay the large expense of having one? And now there are no longer pay phones to stop and make a call at when you get paged. Sun, Feb 5, 2012 : 4:39 p.m. It's been many decades now but I seem to remember in driver's ed classes; the &quot;practice&quot; of driving should be dominated by first keeping hands on wheel in a 10-02 O'Clock positions while the eyes should be trained on the road - shifting eye focus periodically to briefly glance from road to rear view mirrors and speedometer. There was never any &quot;listen to radio, listen to passengers speaking, engage in cell phone call&quot; in that series of actions. IMO: every driver should consider themselves to be on-the-job commercial drivers. It's A JOB to drive a motor vehicle. Driving is not &quot;entertainment&quot; or the opportunity to &quot;socialize.&quot; I've come to really dislike cell phones and those who habitually use them in any and all situations. I carry a cell phone - set to vibrate only for incoming calls. I do not use my cell phone more than once a week. Only my family has my cell phone number. I've told them: Call my cell only for critical matters when you can't reach me any other way. Being in grocery express lanes, in bank waiting lines, etc. while waiting for someone who's on a cell phone to &quot;react&quot; to the fact they are holding up the line is one pet peeve. Seeing anyone (esp. young women) walking alone at night while totally absorbed in a cell phone conversation sends chills down my spine: &quot;a future victim inviting victimization&quot; is what I think at those times. Sun, Feb 5, 2012 : 11:28 p.m. I've learned more recently that the 10 and 2 o'clock thing isn't ideal. There's issues now with thumbs being in the way of airbags. Also, having hands lower and relaxed is just fine. But the poised focus is ideal still, of course. Sun, Feb 5, 2012 : 10:31 p.m. When I was in drivers ed we were taught to drive while listening to and changing radio stations, talking, using phones, etc...I guess more drivers ed classes should be like that. Sun, Feb 5, 2012 : 3:51 p.m. I am of the thorough opinion that all teenagers need to learn how to drive a school bus. With all the things that are needed to learn before you get out there, talk about distractions. If they can handle it? Great. If not? Then they don't get their license until they can. I never knew how much distraction there was until I started driving one. By the way, cell phones are illegal to use on any CDL driven machine. Sun, Feb 5, 2012 : 11:24 p.m. Sounds like your read the recent news story of Graceann Rumer, who steered her school bus to safety after their bus driver suffered a fatal stroke at the wheel. She had just received her driver license. I think this happened in Pennsylvania. Sun, Feb 5, 2012 : 5:35 p.m.
Not a bad idea just impractical. Many experienced drivers could not handle a school bus full of kids. Sun, Feb 5, 2012 : 4:10 p.m.
Sun, Feb 5, 2012 : 3:46 p.m. Excellent article, Kyle. This is an important message to keep getting out to the community. I've experienced the impact of distracted driving both through tragic personal loss and through observation and many near misses as my business takes me out on the roads each day. Cellphone usuage is the most obvious to spot, but there are many kinds of distracted driving. People need to ask themselves whether that phone call, text, burger, drink or conversation in the back seat is worth risking another human being's life. Strict law enforcement is great, but true enforcement begins with taking personal responsibility for your actions behind the wheel, by avoiding driving distractions. Sun, Feb 5, 2012 : 3:30 p.m. This distraction phenomenon is not solely an Ann Arbor or Washtenaw County problem. I now live in a neighboring state and see a huge number of people talking on their cell phones while drivinge 70-75 miles an hour every day. They weave in and out of traffic, drift out of lane, brake at the last minute, routinely cut people off. I don't know that having a smaller police force is the cause (for a rise in the number of accidents). Distracted driving is distracted driving. It can occur from being on a phone, putting on makeup, eating, reading, changing channels on the radio, searching for something in a purse or brief case, dealing with children in the back seat who are misbehaving, having too many passengers in the car who are making too much noise, being intoxicated, being on drugs (including over-the-counter meds). All of these actions can have castastrophic impact. The answer is easy. No distractions while driving - period. It is impossible to enforce it. No number of police officers could cover this dilemma. The problem is so much bigger than the number of people who can work to resolve it. It seems the only time penalty is given to distracted drivers is when there is an accident. By that time, it is too late. Suggestions on what to do?? I personally feel that every time I get on the freeway to go to work, I am taking a tremendous risk due to the number of distracted people on the road. If this is so bad you would be led to believe that there should be cars piled up on the shoulders of every road every single day of the week. I have yet to see or experience this. Are there some accidents caused by cell phones? Yes. Should we ban them? NO! Sun, Feb 5, 2012 : 3:10 p.m. Articles like this need to be published more. Maybe if the facts are kept local that will drive the point home (no pun intended). If stats from other states are posted, people will think, that was there, it won't happen to me. But it does, and the consequences are severe. My brother is the victim of distracted/reckless driving. 8 years ago his friend wasn't paying attention and goofing off while driving. He lost control, and the car hit a tree. My brother was right at the point of impact. After 3 months in the hospital, including being in a coma for 2, and multiple rehab houses later, he has relearned how to talk, eat, think, breathe, and move. He is confined to a wheelchair, but he continues to recover every day. We consider ourselves lucky. The sad part is, this could have all been easily avoided. Please, drive safely out there, if not for yourself, but for everyone else on the road. Sun, Feb 5, 2012 : 2:52 p.m. The title of this article is a national issue as much as a local one. The handy gadgets like cell phones is a real problem. I cannot drive for more than a minute or two on the road without seeing someone driving with one hand and talking on the cell phone with the other. Couple that this snow falling and you get real trouble. Factor in the crowded roadways and you have this epidemic. I agree with a comment that no law enforcement equals no law. The AAPD and other law enforcement agencies must be more proactive in issuing tickets to these types of offenders. Sun, Feb 5, 2012 : 2:20 p.m. I wonder what happened in that case where Mr. Foster was hit by the woman. We never had an update and the woman's name was never released. Was she charged? And why has it taken so long for the person who killed Gary Lillie to go to trial? Are the authorities taking these incidents seriously. One of the first things you learn in motorcycle riding is that you when operating a motor vehicle, you will go where you look. It's a natural occurrence. Target fixation is when you stare at an object, you automatically drive toward that object if you aren't aware. These things need to be taught to people. Sun, Feb 5, 2012 : 2:08 p.m.
"Removing eyes from the road for two seconds at 55 miles per hour causes you to travel 160 feet unaware of what is in front of you and creating a total emergency," Losey said. "Stopping distance is about 300 feet, or a football field in distance.&quot; With this statement; seems billboard signs along many interstates and other highways are another major cause of distraction. I say we should outlaw them completely and have them all taken down. They are just visual pollution anyhow, not to mention all the greenhouse gases associated with operating them. I wonder how many people have lost their lives or became seriously injured these many decades they have been in use. Take them all down and plant trees in their place! Sun, Feb 5, 2012 : 11:25 p.m.
Sun, Feb 5, 2012 : 10:23 p.m.
More people tend to look at beautiful trees along a road - specifically in the fall so you're just replacing one distraction with another. How about teaching drivers their responsibility than then enforcing it. That way - when you get behind a 2 ton+ killing machine - you know if you screw up - you pay the price. Then, you will see drivers pay closer attention to driving and less about other potential distractions. Sun, Feb 5, 2012 : 2:01 p.m.
What should be strongly considered, which will aid officers, is that drivers are encouraged/rewarded for reporting truthfully what happened at an incident, however embarrassing it may be, without fear of additional repercussions. There shouldn't be an additional punishment for driving distracted or unsafe for conditions as I expect ALL incidents that are &quot;accident&quot; happen this way. We want the data on how incidents happen so we as society can learn and better prevent them from happening in the future. The repercusssions for being caught hiding valuable information should be substantial enough to make those involved consider being forthcoming from the start. Sun, Feb 5, 2012 : 1:54 p.m.
No enforcement from A2PD = No laws Reducing our police department has a great impact on car accidents, when will Mayor Heiftje wake up? People are doing many things while driving now: texting, talking on the phone, listening to music with earbuds, applying make-up, eating, and flossing their teeth (yes, someone behind me was doing this on S. Main the other morning during AM rush hour!) Besides driving distracted, people think that stop signs and red lights are now optional here in A2. To another commenter: Police officers are trained to multi-task while they drive; ordinary citizens are not. Sun, Feb 5, 2012 : 4:06 p.m.
Get you facts right!! <a href="http://www.annarbor.com/news/crime/man-accused-in-death-of-veterans-advocate-gary-lillie-is-released-from-jail/">http://www.annarbor.com/news/crime/man-accused-in-death-of-veterans-advocate-gary-lillie-is-released-from-jail/</a> The driver that hit Gary Lillie was allegidly DRUNK. This article is a disgrace. Sun, Feb 5, 2012 : 10:03 p.m. Yes, he blew a .12 on the breathalyzer. Dropped phone was claimed but drunk is drunk. EyeheartA2 You can't blame this blog! They have not had a controversial story in a couple days. Not enough hits' so they rehash old news! Sun, Feb 5, 2012 : 12:56 p.m.
Added to this list can be distracted walking, which is crossing the street, oblivious to all traffic, expecting not to be hit. Distracted driving is a real problem that does occur in downtown Ann Arbor, and can be dangerous. Unfortunately, it is one that the Ann Arbor police seem to ignore. Instead of manning speed traps on roads with artificially low speed limits, (MDOT says many should be raised), It would be fantastic if some of Ann arbor's finest would be redeployed to downtown to observe and ticket those who turn left from the far right lane (or vice-versa), ignore those in crosswalks, pedestrians who ignore traffic control devices, and bicycles who flaunt the laws. And, ticket those who speed downtown when there are a lot of people and traffic. But redeploy away from the known revenue zones and concentrate on safety. Ann Arbor's police officers do a wonderful job and are quite professional and courteous, and I doubt that the decision to man enforce some locations instead of others is that of an individual officer, but comes from higher up. If the goal is public safety, then redeploying more officers to downtown makes sense. Mon, Feb 6, 2012 : 5:19 p.m. I would add dog walking as a distraction. I see people managing a leash doing the dumbest things on the sidewalk, including collisions/wraparounds with other pedestrians. Mon, Feb 6, 2012 : 11:51 a.m.
Last time I checked pedestrians distracted or otherwise always have the right of way. If you are unable to see a pedestrian than perhaps you shouldn't be driving. Sun, Feb 5, 2012 : 11:22 p.m.
Driving involves operating an enormous, potentially high-speed, machine that easily kills people. Distracted walking and biking are problems when they occur (possibly much more rare than distracted driving), but they simply don't cause the numbers of serious tragedies that distracted driving causes. There's no comparison, so trying to make one is not justified at all. Jim, your first sentence says quite a bit. This is especially true around Central Campus where the Students love to put the pedestrian/crosswalk law to the point of being dead right! Add to the list the bicyclists that completely refuse to yield to anybody or anything. Sun, Feb 5, 2012 : 1:35 p.m.
Jim, I suspect that many officers would feel hypocritical giving tickets to distracted drivers. All too often, I've seen officers talking on their cell phones while driving. Added to this is the fact that politicians are reluctant to pass laws restricting such activity for the same reason and that they might lose funding from the communications industry.